Today is the birthday (1743) of Luigi Rodolfo Boccherini, Italian classical era composer and cellist whose work has a certain courtly air because he wrote most of his more famous pieces away from the major musical centers of his day and they retained an “old” feel. Chances are that if you do not know anything else he wrote, you know his minuet from his String Quintet in E major, Op. 11, No. 5 (G 275). Boccherini was born in Lucca, in northern Italy, into a musical family. At a young age he was sent by his father, a cellist and double bass player, to study in Rome. In 1757 they both went to Vienna where they were employed by the court as musicians in the Burgtheater. In 1761 Boccherini went to Madrid, where he was employed by Infante Luis Antonio of Spain, younger brother of King Charles III. Boccherini generally flourished in Spain, but one day the king expressed disapproval of a passage in a trio Boccherini was working on. So he doubled the passage to spite him, and was dismissed by the king. He then accompanied the Infante to a palace in Arenas de San Pedro, a little town in the Gredos mountains where Luis Antonio had been exiled by the king for marrying a commoner. There, and in the closest town of Candeleda, Boccherini played and wrote many of his most famous works under the Infante’s patronage. 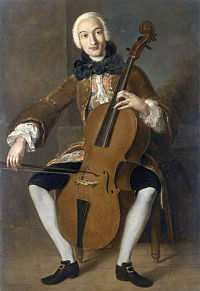 Boccherini was a renowned cello virtuoso. One of my favorite stories is that he could play the chamber violin repertoire on the cello, at pitch, because he sometimes stood in for violinists who were sick. Although much of Boccherini’s chamber music follows models established by Joseph Haydn, Boccherini is often now credited with enhancing the model, especially of the string quartet, by giving the cello more prominence. Le campane de l’Ave Maria – The Ave Maria Bell; the main church calls the faithful for the Ave Maria prayers. Il tamburo dei Soldati – The Soldiers’ drum. Minuetto dei Ciechi – The Minuet of the Blind Beggars. Boccherini directed the cellists to place their instruments upon their knees, and strum them, like guitars. Il Rosario – The Rosary, a slow section not played in strict time. Passa Calle – The “Passacaglia” of the Street Singers, (Los Manolos), lower-class show offs. It is not a true passacaglia. In Spanish, pasa calle means “pass along the street,” and the idea is to imitate the amusement of people (probably drunk) singing in the streets. Il tamburo – The drum. Ritirata – The retreat (of the Madrid military night watch). After this there was a curfew, and the streets were closed for the night. The composition was famous in Spain during Boccherini’s lifetime. However, it was not published until years after Boccherini’s death, because, he told his publisher: “The piece is absolutely useless, even ridiculous, outside Spain, because the audience cannot hope to understand its significance, nor the performers to play it as it should be played.” As far as I am concerned he still has that correct. The version I give here is not awful. Lucca has a well known cuisine. 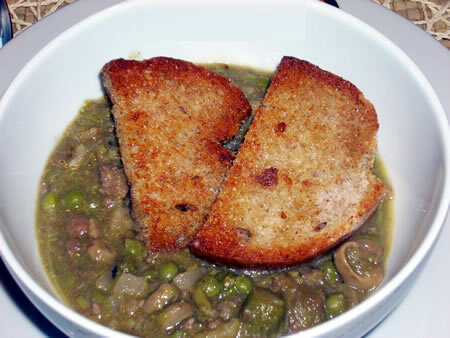 Here is Garmugia, a wonderful soup of spring green vegetables. The original peasant dish of the 16th century probably had very little meat. You can make it meatless. Cook’s choice. Proportions here are just from my head. Make sure only that you use fresh spring green vegetables; the rest is up to you. It should be thick and hearty. Sauté the scallions and diced pancetta in a dutch oven or heavy stock pot with a little olive oil. Once the scallions have softened, add the ground veal and brown it over high heat, stirring frequently. Add the broth and vegetables and cook covered over low heat for about 30 to 40 minutes, with salt and pepper to taste. You may lengthen or shorten your cooking time depending on how soft you want the vegetables to be. Serve with toasted Italian bread croutons or slices.